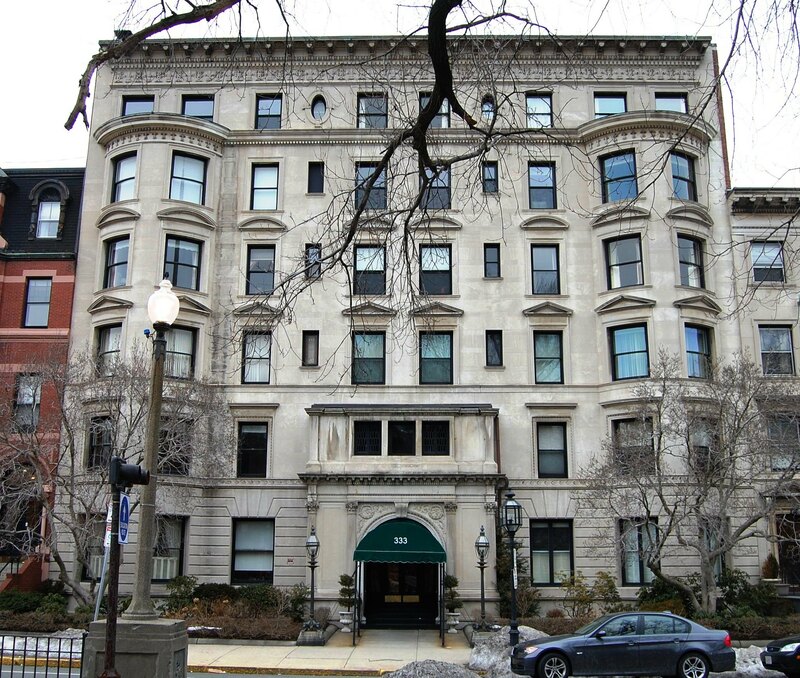 New construction in the Back Bay slowed during the 1890s as the number of available open lots dwindled. The period saw the construction of a number large apartment houses and apartment hotels, including: The Abbotsford at 186-188 Commonwealth, expanding the original apartment house at 184 Commonwealth, built in 1889; The Charlesgate at 4 Charlesgate East (535 Beacon), which soon expanded into the 10 Charlesgate East; The Chesterfield at 371 Commonwealth and The Ericson next door at 373 Commonwealth; Haddon Hall at 282 Berkeley, the height of which prompted significant opposition; the Hotel Empire (later the Hotel Lafayette) at 333 Commonwealth; the Hotel Tuileries at 270 Commonwealth; The Marlborough at 416 Marlborough; The Colonial at 382 Commonwealth and The Torrington at 384 Commonwealth; the Hotel Somerset at 400-416 Commonwealth; and the Hotel Cambridge at 483-485 Beacon. A number of smaller apartment houses also were constructed during this period. Also in the 1890s, another major church was added to the neighborhood: the Mt. Vernon Congregational Church at 490-492 Beacon at the northeast corner of Beacon and Massachusetts Avenue. In 1899, 316 Commonwealth was razed and replaced by 314 Commonwealth, a new house on the site of 316 Commonwealth and on a vacant lot next door, at the southwest corner of Commonwealth and Hereford.. The map below indicates when a building was first constructed on a specific lot through 1899. Included are lots within the residential portion of the Back Bay, as defined for purposes of this website, plus buildings on the north side of Newbury. The dates used are based on original permit applications or similar documentation, when available. When no such documentation is available, the dates provided in Bainbridge Bunting’s Houses of Boston’s Back Bay are used. If an original building was replaced or rebuilt , the date of original building (not the replacement) is shown. If a replacement building occupied both a vacant lot and the site of a previous building (e.g., 314 Commonwealth at the southwest corner of Hereford), the vacant lot is shown with the date of the replacement building and the previously occupied lot is shown with the date when the original house was built. Following the map is a list of the 89 buildings constructed between 1890 and 1899 in the residential portion of the Back Bay. Below is a list of the 89 buildings constructed between 1890 and 1899 in the residential portion of the Back Bay. Houses indicated as demolished were replaced by 2015; buildings indicated as replacements were built on lots where earlier structures previously were located; buildings indicated as partial replacements were built on a combination of vacant lots and lots where earlier structures had been located.